How did island woman's son fare in "The Amazing Race?" Over beer, wine and a massive bowl of onion dip, Susan Citron watched her son begin his well-documented race around the world. From their home overlooking Broad Creek on the south end of Hilton Head Island, the doting mother and her husband, Arnie Blakeman, nervously watched the season premier of CBS' "The Amazing Race." Her son, Terence Gerchberg, and his girlfriend, Sarah Leshner, are one of 11 teams competing for $1 million. estate on the side. Sarah, 32, is a financial analyst on Wall Street who has an MBA from the Wharton School of the University of Pennsylvania and has studied abroad. The couple live in New York and had been dating for six months when they embarked on the race that spans 30,000 miles and five continents. In real life, it took 23 days. On television, it'll play out over the next 10 weeks. Mental and physical challenges produce clues to the next destination. A team is eliminated after eight of the 11 legs. 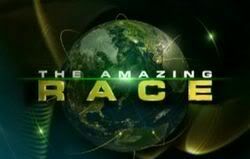 Because the race was filmed in April and May, the secret of who won "The Amazing Race" is fiercely guarded. Contestants can't even tell their loved ones how they fared. Citron and Blakeman had never seen the show before Sunday. "Oh my God!" exclaimed Citron when Terence and Sarah, who are characterized as opposites, were introduced. "He looks great, doesn't he?" The first leg of the race took the teams from Los Angeles to Brazil. Both locations were strong suits for Terence, who lived in L.A. and dated a woman in Buenos Aires, and Sarah, who speaks several languages including, it seemed on Sunday, Portuguese. The team bickered early on, providing some signs that their intensity might end up causing a meltdown. Terence said he just wanted to be "held" and "connected with" while Sarah chatted up other teams. "This isn't a popularity contest," Terence later said in a taxi in Salvador. "Sarah wants everybody to like her. I could care less if nobody speaks to me ... ."
That made his mother laugh. "That's my boy," she said. "He's the luckiest kid ever. He goes against the odds, and it doesn't matter. He just doesn't take 'no' for an answer." After making the mistake of taking the elevator instead of stairs to the top of a tower, the team recovered on the first leg of the race. They ended up in third place on a floating fort, Forte Sao Marcelo, which was built to defend the port from pirates. "What do you think?" Citron asked. "Does my kid have a chance?" Hey all, I was with Sarah and Terence last night watching the show and just did a blog post about it. You can check it out here: http://terenceandsarah.typepad.com/ I hope everyone's enjoying the show! Yes, we definitely have the love for Sarah! Oh, i'm so glad to see some good Sarah vibes here. As nerve-wracking as I know it is for Sarah (and all the racers I'm sure) to see how she's received by the world, it is pretty tense also for those of us who know and love her too! She is truly one of the kindest, coolest people I know and I'm so happy to see that shine through this week. I just did a new blog about it...as she also totally surprised me by rocking a cause that's near and dear to my heart on the show tonight. You can check out what I'm referring to here: www.chooselovemore.com if you're curious. I also updated the Terence & Sarah blog at www.TerenceandSarah.typepad.com. Sarah is such a good girl and I loved watching her tonight. Yea Sarah! Yeah, I know the friends hate the less than impressed fans, but if you are Sarahs' real friend tell her to get a new BF! There is an imbalance in this relationship. Oh there's no hate, I totally get it...it's just nerve-wracking! I'm sure it's like watching your child in a ballet recital...you just so hope they don't fall off the stage. You know, after watching the insider videos, I really think that Terrence is getting a horrible edit. I saw those pictures but, for me anyway, what happens on Facebook stays on Facebook unless I'm asked to do otherwise but, again.. thats just me. yeah I saw them too, Christy told me that new york was a blast! I'm glad they can all have fun after the race is over and stuff. This couple is a hoot. I had to laugh when the guy bumped his head LOL. I have done crazy things like that and been hurt. LOL. When he said could you blow on this I was like wow whose the man and who is the woman. Not that men can't be sensitive, but he is very needy. Maybe she is just too independent for him? Did anyone else get totally pissed off when Terrence demanded that she rub his head while driving. What the heck dude?! I have decided that Terence may be getting a bad rap. Is CBS trying too hard to make him a villain? Are we just seeing an intense racer? I find it quite telling that the last three teams eliminated, when asked who they would like to see win the race (keeping in mind that they know the outcome of course) have responded "Terence and Sarah". So among the racers so far, they seem to be quite popular! In any case, they have started a "redemption" edit I think in showing him poling the boat and the insider vid showing him so taken with the experience of Cambodia. Terence, the one half of Terence and Sarah team in season 13 of Amazing race will be running at this Sunday’s New York marathon. And while I'm here I've been meaning to point out the ugly unfair editing that Eric got during All Stars and we know personally what a great guy he is so for whatever reasons TPTB are giving Terence a ugly editing I have no idea, I am sure hes a great guy, and my gut tells me so and I'm a pretty good people person. So know Terence that you have fans that do not judge you by the editing , you and Sarah are damn good racers! Sooooo funny this episode! Some of the best lines of the epi! Who's my girl? You are! How can I get this up my nose??? The first episode T/S really got a bad edit.. but right now.. it seems the producers are dead serious in making N/S the villians and T/S maybe just another team who often freaked out. Somebody already mentioned the "who's my girl - it's you babe" earlier. But the best was yet to come..
"I just wish there was another team right here with us suffering alongside of this. They're breezing thru that other frickin' detour and we're like suffering here like fools!" "If somebody said to be right now, put cow manure on your body and it'll make you feel better, I'd lather myself up with that - that's how much pain I'm feeling!!!!!"